I know it's only November, but I've definitely caught the festive bug; I've started my Christmas jigsaw, stockpiled Christmas magazines and I've even dabbled with a bit of jolly Christmas music. It was the reindeer parade in my local town at the weekend, so out came the Christmas socks (it seemed rude not to bring them out for the occasion) and I've even managed to do a bit of Christmas shopping (although the dreaded wrapping phase won't come until much later). I love this time of year as the festive momentum builds. We've already had the John Lewis advert (which I LOVE as it's sweet and funny and kicks the man on the moon's arse - it was a bit crap, wasn't it?) and the shops start to sparkle with baubles and tinsel. It's too early to deck our homes in the sparkly stuff, but we know it's jut around the corner. One of the things that really gets me in the Christmas mood are festive reads. I love a cosy Christmassy story to curl up with, a cup of tea or hot chocolate by my side and perhaps a mince pie or two. I love festive reads so much I wrote my own, packing it with festive baking, family fun and a dash of Christmas magic. 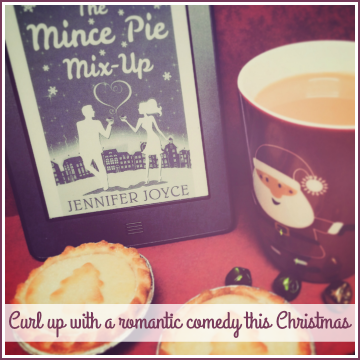 I loved writing The Mince Pie Mix-Up and I hope its readers will experience the same joy and festive sparkle!